We post a lot of inspirational images and snapshots of our organizing work on social media, and we love sharing tips and kudos with the online organizing community and our followers. But at the heart of Ease Up is the pull to do more than market beautiful, organized spaces. We want to enhance ease in people’s lives and empower them to make decisions that support their best selves. That means providing compassionate support and clarity whenever possible so people who engage with our content can understand not just what we do as professional organizers, but how and why we do it. In this series of posts I’m going to share — in detail — the process we go through with our clients once we’ve been hired to organize their space. I’ll also offer some tips about actions that enhance productivity and morale for all involved. My goal is to arm you with knowledge and enthusiasm, and to help you prepare mentally and practically. So if you do decide to work with professional organizers, you’ll be supercharged with money and energy saving efficiency tools — and heaps of good vibes on the day, too. Ready? Let’s dive in to today’s topic…. The first thing we do when we enter the space we’re organizing is clear everything out — of cabinets, drawers, shelves, chests — and sort like items together. People naturally accumulate objects over time, which often leads to creating multiple storage solutions in different places to accommodate it all. We want to get all your like items together, so you can see what you have and so we can create more efficient systems for you. Finding and sorting can take a while, so patience and good faith go a long way. When we start putting a room back together (phase 2), the last thing we want is to find that we missed a piano bench full of miscellaneous items that then need to be consolidated somehow. 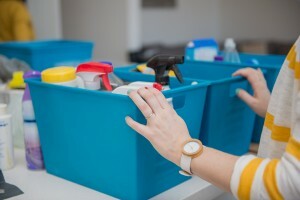 This process is so important to the overall organizing result, that if a client is onsite working with us, they can expect to hear team-members supporting each other by checking in and asking, “Have you touched everything?”. We need to be meticulous at this stage to avoid time-sucking do-overs later on. Finding and sorting are admittedly the less exhilarating aspects of the project, so we try to prepare our clients for this phase by letting them know that things will certainly look worse before they get better. But it will get better — we promise! 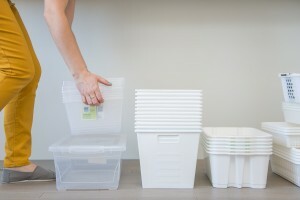 We come in with tons of bins, and we use available surfaces to sort, sort, sort! It can be stressful to see everything they own displaced and out for viewing, but if clients can dig in, trust us and embrace the process, we can accomplish big things during this phase that set us up for success in the next. Once the client can see their items laid bare, we start to release what no longer serves them. We have bags and boxes for donation and for disposal, and we go through each category with our clients to help them make decisions. We encourage them to carefully consider whether each item they own either delights them or is useful to them in their life as it is now (not as it was 5 years ago or as they hope it to be down the road). This process can be time-consuming and emotionally demanding for a lot of people. I must say, though, that the clients who have the most satisfying end result are those who embrace this challenge. This powerful act of releasing creates more space — physical space, of course, but also emotional, mental, and practical space — for the things that do serve and delight. Some feel embarrassed at their accumulated volume. Some feel anxious wondering how chaos could possibly be transformed into calm in the allotted time. Some feel impatient about the process and they want to jump right to the “big reveal” without exerting effort or experiencing discomfort. Some feel enthusiastic and optimistic about every step of the journey. Some feel quiet relief to see the process beginning. Everyone is different, and our team has experience supporting clients all along this continuum of completely natural responses. We know how to do this work, and we’re here for you. So, there you have it! Make sure to check out parts 2 and 3 of our series on the Ease Up Method for insights into the rest of the process, and of course, don’t hesitate to reach out personally. 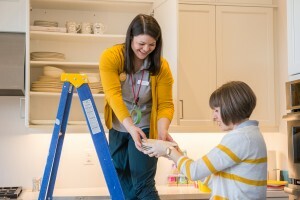 We’re always happy to answer questions you still have about your unique space and needs. Or better yet, contact us about scheduling your in-home consultation and let’s get started on creating more ease in your life.